This section describes the QML API exposed by the PyOtherSide QML Plugin. The current QML API version of PyOtherSide is 1.5. When new features are introduced, or behavior is changed, the API version will be bumped and documented here. importModule() now behaves like the import statement in Python for names with dots. This means that importModule('x.y.z', ...) now works like import x.y.z in Python. addImportPath() now also accepts qrc:/ URLs. This is useful if your Python files are embedded as Qt Resources, relative to your QML files (use Qt.resolvedUrl() from the QML file). The Python element exposes a Python interpreter in a QML file. In PyOtherSide 1.0, if multiple Python elements are instantiated, they will share the same underlying Python interpreter, so Python module-global state will be shared between all Python elements. Default event handler for pyotherside.send() if no other event handler was set. Error handler for errors from Python. Changed in version 1.4.0: If the error signal is not connected, PyOtherSide will print the error as QWarning on the console (previously, error messages were only shown if the signal was connected and printed there). To avoid printing the error, just define a no-op handler. Set the handler for events sent with pyotherside.send(). Add a path to Python’s sys.path. Changed in version 1.1.0: addImportPath() will automatically strip a leading file:// from the path, so you can use Qt.resolvedUrl() without having to manually strip the leading file:// in QML. Changed in version 1.3.0: Starting with QML API version 1.3 (import io.thp.pyotherside 1.3), addImportPath() now also accepts qrc:/ URLs. The first time a qrc:/ path is added, a new import handler will be installed, which will enable Python to transparently import modules from it. Changed in version 1.2.0: Previously, this function didn’t work correctly for importing modules with dots in their name. Starting with the API version 1.2 (import io.thp.pyotherside 1.2), this behavior is now fixed, and importModule('x.y.z', ...) behaves like import x.y.z. Call the Python function func with args asynchronously. If args is omitted, func will be called without arguments. If callback is a callable, it will be called with the Python function result as single argument when the call has succeeded. Changed in version 1.4.0: func can also be a Python callable object, not just a string. Get the attribute attr of the Python object obj. Evaluate a Python expression synchronously. Import a Python module. Returns true on success, false otherwise. Import names from a Python modules. Returns true on success, false otherwise. Call a Python function. Returns the return value of the Python function. The following functions allow access to the version of the running PyOtherSide plugin and Python interpreter. Get the version of the PyOtherSide plugin that is currently used. This is not necessarily the same as the QML API version currently in use. The QML API version is decided by the QML import statement, so even if pluginVersion() returns 1.2.0, if the plugin has been imported as import io.thp.pyotherside 1.0, the API version used would be 1.0. Get the version of the Python interpreter that is currently used. Changed in version 1.5.0: Previously, pythonVersion() returned the compile-time version of Python against which PyOtherSide was built. Starting with version 1.5.0, the run-time version of Python is returned (e.g. PyOtherSide compiled against Python 3.4.0 and running with Python 3.4.1 returned “3.4.0” before, but returns “3.4.1” in PyOtherSide after and including 1.5.0). The PyGLArea allows rendering arbitrary OpenGL content from Python into the QML scene. Python object that implements the IRenderer interface, see OpenGL rendering in Python for details. 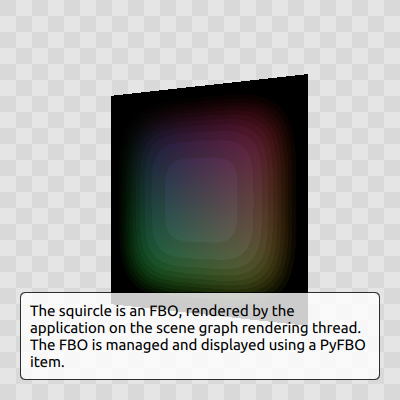 The PyFBO allows offscreen rendering of arbitrary OpenGL content from Python into the QML scene. PyOtherSide uses a normal Python 3.x interpreter for running your Python code. The module can be used to send events asynchronously (even from different threads) to the QML layer, register a callback for doing clean-ups at application exit and integrate with other QML-specific features of PyOtherSide. Send an asynchronous event with name event with optional arguments args to QML. Register a callback to be called when the application is closing. Set the QML image provider (image://python/). Check if filename is an existing file in the Qt Resource System. True if filename is a file, False otherwise. Check if dirname is an existing directory in the Qt Resource System. True if dirname is a directory, False otherwise. Get the file contents of a file in the Qt Resource System. ValueError – If filename does not denote a valid file. The file contents as Python bytearray object. Get the entry list of a directory in the Qt Resource System. ValueError – If dirname does not denote a valid directory. The directory entries as list of strings. Mono pixel format, LSB alignment (QImage::Format_MonoLSB). Encoded image file data (e.g. PNG/JPEG data). Version of PyOtherSide as string. list JS Array JS Arrays are always converted to Python lists. Trying to pass in other types than the ones listed here is undefined behavior and will usually result in an error. A QML Image Provider can be registered from Python to load image data (e.g. map tiles, diagrams, graphs or generated images) in QML Image elements without resorting to saving/loading files. The ID of the image URL (image://python/<image_id>). The source size of the QML Image as tuple: (width, height). (-1, -1) if the source size is not set. A bytearray object containing the pixel data for the given size and the given format. A tuple (width, height) describing the size of the pixel data in pixels. The pixel format of data (see constants), pyotherside.format_data if data contains an encoded (PNG/JPEG) image instead of raw pixel data or pyotherside.format_svg_data if data contains SVG image XML data. Because Python modules are usually imported asynchronously, the image provider will only be registered once the module registering the image provider is successfully imported. You have to make sure that setting the source property on a QML Image element only happens after the image provider has been set (e.g. by setting the source property in the callback function passed to importModule()). Importing Python modules from Qt Resources also works starting with QML API 1.3 using Qt.resolvedUrl() from within a QML file in Qt Resources. As an alternative, addImportPath('qrc:/') will add the root directory of the Qt Resources to Python’s module search path. It’s not possible to instantiate new QObjects from within Python, and it’s not possible to subclass QObject from within Python. Also, be aware that a reference to a QObject in Python will become invalid when the QObject is deleted (there’s no way for PyOtherSide to prevent referenced QObjects from being deleted, but PyOtherSide tries hard to detect the deletion of objects and give meaningful error messages in case the reference is accessed). Calling (emitting) signals of QML objects is supported since PyOtherSide 1.5.4. However, as signals do not have a return value as such, the return value is either just true or false , depending on whether the call worked or not. You can render directly to a QML application’s OpenGL context in your Python code (i.e. via PyOpenGL or vispy.gloo) by using a PyGLArea or PyFBO item. Initialize OpenGL resources required for rendering. This method is optional. Called when the geometry has changed. (x, y) is the position of the bottom left corner of the area, in window coordinates, e.g. (0, 0) is the bottom left corner of the window. 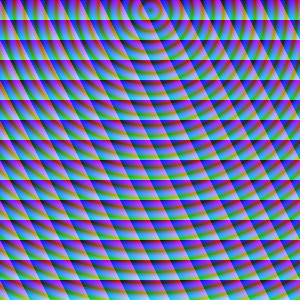 Render to the OpenGL context. It is the renderer’s responsibility to unbind any used resources to leave the context in a clean state. Free any resources allocated by IRenderer.init(). This method is optional. See Rendering with PyOpenGL for an example implementation. This section contains code examples and best practices for combining Python and QML. In this example, we import the Python Standard Library module os and - when the module is imported - call the os.getcwd() function on it. The result of the os.getcwd() function is then printed to the console and os.chdir() is called with a single argument ('/') - again, after the os.chdir() function has returned, a message will be printed. In this example, importing modules and calling functions are both done in an asynchronous way - the QML/GUI thread will not block while these functions execute. In fact, the Component.onCompleted code block will probably finish before the os module has been imported in Python. While this continuation-passing style might look a like a little pyramid due all the nesting and indentation at first, it makes sure your application’s UI is always responsive. The user will be able to interact with the GUI (e.g. scroll and move around in the UI) while the Python code can process requests. Evaluating expressions is done synchronously, so make sure you only use it for expressions that are not long-running calculations / operations. Once your application grows, it might make sense to maybe show the error to the user in a dialog box, message or notification in addition to or instead of using console.log() to print the error. Once a handler for a given event is defined, the received() signal will not be emitted anymore. If you need to unset a handler for a given event, you can use setHandler('event', undefined) to do so. Instead of passing a list-of-dicts, it is of course also possible to send new list items via pyotherside.send(), one item at a time, and append them to the list model that way. The example below shows how to do raw OpenGL rendering in PyOpenGL using PyGLArea. It has been adapted from the tutorial in the Qt documentation at http://qt-project.org/doc/qt-5/qtquick-scenegraph-openglunderqml-example.html. text: "The background here is a squircle rendered with raw OpenGL using a PyGLArea. This text label and its border is rendered using QML"
Alternatively, you can edit python.pri manually and specify the compiler flags for compiling and linking against Python on your system. As of version 1.3.0, PyOtherSide does not build against Python 2.x anymore. On Blackberry 10 (tested versions: 10.1, 10.2), Python 3.2.2 is already installed on-device. Qt 5 is not installed (only Qt 4), so if you are packaging a PyOtherSide application, you need to ship Qt 5 with it. After installing PyOtherSide in the locally-build Qt 5 (cross-compiled for BB10), the QML plugins folder can be deployed with the .bar file. Unlike Blackberry there is no Python or Qt present by default and both need to be shipped with the application. A more detailed guide follows. It describes how to get from the source code of the relevant components to being able to run an Android application with a Qt Quick 2.0 GUI running on an Android device. The gPodder podcast aggregator serves as (full featured & fully functional!) example of such an application. This is just one example environment where these build instructions have been tested to work. Reasonably similar environments should work just as well. The build is going to be done in a folder called build in the users home directory, lets say that the use is named user (replace accordingly for your environment). Now clone the needed projects, load submodules and switch to correct branches. Next we will build Python 3 for Android. This will first download the Android NDK, then Python 3 source code, followed by crosscompiling the Python 3 code for Android on ARM. NOTE that this step alone can require multiple GB of harddisk space. PyOtherSide will then use the qrc mechanism to compile the compressed standard library during inside it’s own binary. This removes the need for us to handle its shipping & loading ourself. Next open the pyotherside/pyotherside.pro project file on QtCreator, select the Android kit and once the project loads go to the project view and make sure that under run the API level is set to 14 (this corresponds to Android 4.0 and later). The Android Python 3 build has been built for API level 14 and our PyOtherSide build should do the same to be compatible. Also make sure that shadow build is disabled, just in case. Once done with the configuration got to the build menu and select the built pyotherside option - this should build PyOtherSide for Android and statically compile in our Python build and also include the Python standard library zip file with qrc. As the next step we need to move the PyOtherSide binary to the QML plugin folder for the Qt Android SDK, so that it can be fetched by the SDK when building gPodder. Next open the gPodder project in QtCreator (gpodder-android/gpodder-android.pro) and again make sure the Android kit is selected, that the API level 14 is used and that shadow build is disabled. Then just press the Run button and the SDK should build an Android APK that includes the libpyotherside binary (it fetched automatically from the plugins directory because is referenced in the gPodder QML source code) and deploy it to the device where gPodder should be started. We use VS 2010 instead of MinGW, because the MinGW version of Qt depends on working OpenGL driver, whereas the non-OpenGL version uses Direct3D via ANGLE. Also, Python is built with Visual C++ 2010 Express (see Compiling Python on Windows), so using the same toolchain when linking all three components (Qt, Python and PyOtherSide) together makes sense. The necessary customizations for building PyOtherSide successfully on Windows have been integrated recently, and are available since PyOtherSide 1.3.0. In src/qmldir: Change plugin pyothersideplugin to plugin pyothersideplugin1. This is needed, because on Windows, the library version gets encoded into the library name. In python.pri: Modify it so that the Python 3 libs/ folder is added to the linker path, and link against -lpython33. Also, modify it so that the Python 3 include/ folder is added to the compiler flags. With the updated qmldir and python.pri files in place, simply open the pyotherside.pro project file in Qt Creator, and build the project. Configure a Release Build, and disable Shadow Builds. Access to the Qt Resource System from Python (see Qt Resource Access). QML API 1.3: Import from Qt Resources (addImportPath() with qrc:/). Add pyotherside.version constant to access version from Python as string. Support for building on Windows, build instructions for Windows builds. New data type conversions: Python set and iterable types (e.g. generator expressions and generators) are converted to JS Array. Introduced versioned QML imports for API change. QML API 1.2: Change importModule() behavior for imports with dots. New data type conversions: Python datetime.date, datetime.time and datetime.datetime are converted to QML date, time and JS Date types, respectively. Add support for Python-based image providers (see Image Provider). Fix threading crashes and aborts due to assertions. addImportPath() will automatically strip a leading file://. Added pluginVersion() and pythonVersion() for runtime version detection. Proof-of-concept (based on a prototype from May 2011). © Copyright 2014-2019 Thomas Perl Revision ebe28454.